Four-color process printed on both sides of 12pt C2S Semi-Gloss stock. Coated with Aqueous Gloss. H1 business card slits on right pocket. Agricultural broker G.W. 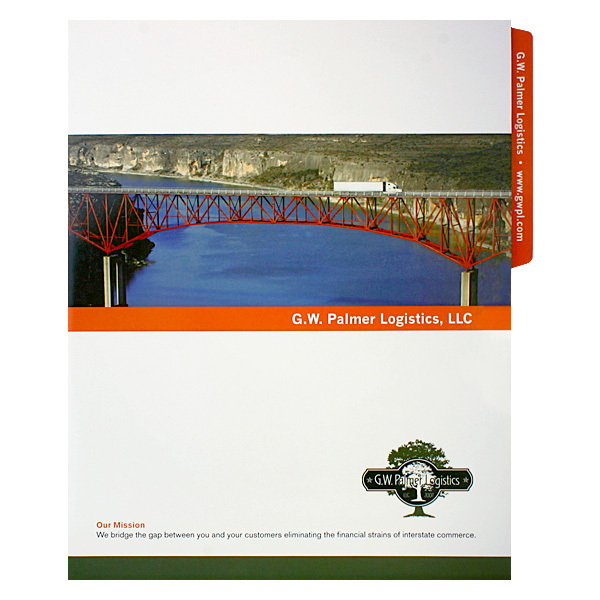 Palmer's cover image of a semi truck crossing a bridge embodies the brand's mission to "bridge the gap" between farmers' fields and consumers' tables. The trucking company's use of orange accents indicates energetic, cost-effective service, as the color is commonly associated with affordable pricing. Traces of orange on the cover explode into a field of color on the interior panels. A faded watermark of a bridge reinforces the brand's identity, while the black pocket adds a neutral color so the eye isn't overwhelmed. A paragraph at left tells customers more about G.W. Palmer's services. Four-color process on both sides of 14pt C2S White Semi-Gloss stock. Coated with Aqueous Gloss. H1 business card slits on right pocket. Navy panels with white type and a white logo play into a nautical theme. 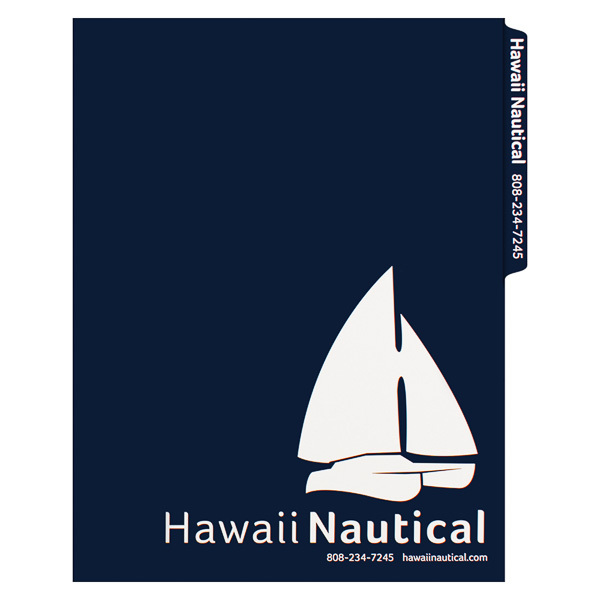 A branded file tab lets guests call to book their dream excursion with Hawaii Nautical. Photos inside show the adventures they can enjoy, from snorkeling and scuba diving to whale watching and dinner cruises. Guests can learn about other services on the right panel, which also includes contact information and a blurb about the brand's eco-friendly practices. One more photo on the back shows a Hawaii Nautical boat making an expedition under a gorgeous blue sky. 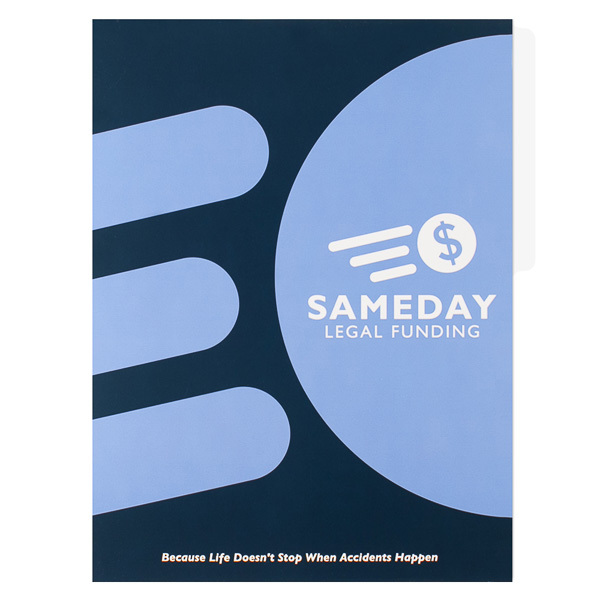 Dark navy panels help establish clients' trust in Sameday Legal Funding, which gives cash advances to legal clients until their cases are settled. Periwinkle accents infuse the design with a light, soothing touch. Three stripes point to the Sameday logo, creating a sense of motion and speed. The tagline at the bottom reminds clients why they need the brand, while the pocket logo reinforces its identity. Side 1 printed with four-color process and 1 embossed area. 80lb Wheat Tweed stock (currently unavailable) uncoated. B2 brochure slit on right pocket. Hamburger Gibson Creative merged digital imagery and print techniques in this clever design. With its smooth vector lines and reflective look, the embossed hamburger logo pays tribute to the creative firm's digital work and to owner Martin Hamburger. Its raised texture also lets users "click" the icon for an interactive tactile element. Fully open, the front and back covers resemble a menu. 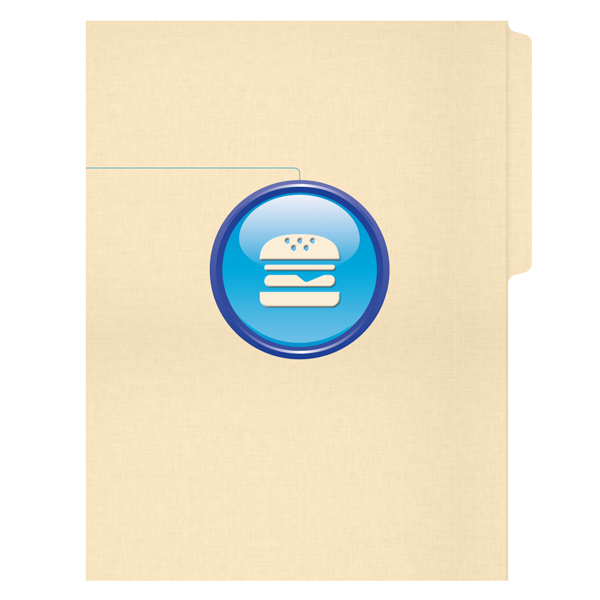 A blue line connects the hamburger to the ingredients that make the company so successful. Inside, a custom slit on the right pocket lets recipients carry media as large as a brochure, while the blank left tab allows them to write a custom description of the pocket's contents. Designed with easy storage in mind, this product features a 1/2" tab that can be custom printed with a 3/8" x 4 3/4" likeness of your company name, logo, or other identifying text to make it stand out in a filing cabinet. The tab's prominent location in the top or left position means your customers can't miss it. The single right pocket guarantees that 8 1/2" x 11" documents stay snug, without slipping or chafing. Imprint the pocket, covers, and left panel with your custom images and text to make this a one-of-a-kind design that gets noticed everywhere it goes.